I came to Anguilla in 1985 for business. I loved the island and stayed there for years... leaving in 1994 when Dr. William Herbert went missing at sea. He was my attorney... I miss him so much. Those days an entertainer by the name of Sproker was the hot item along with Corn Flakes, they were my friends too. Uncle Ernie's on Shoal Bay was the hot spot. I can remember eating BBQ chicken on the beach on Christmas day, sitting on a lounge in the water, dancing to the steel drums on Sunday afternoon. Anguilla has one some of the most beautiful beaches in the world and the friendliest people in the Caribbean. I miss Anguilla. PS. While I was living there, the only Anguilla celebrity that visited the island was Chuck Norris. He built a home there for his wife but soon divorced thereafter. He was my neighbor and often used my office in the Valley. I loved him so much, so special. Nori's Reply: Deborah, thank you so much for such a special account of Anguilla back in the day. I would love to have seen the island in those days... so quiet, exotic, remote. Do you have any photos of your time on the island? I uploaded a photo (above) we took from the water of Chuck Norris' former Anguilla villa. 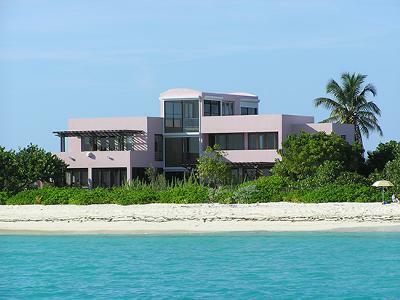 Chuck Norris' ex-wife still lives on island (not sure how many months out of the year), though has now sold this Anguilla villa to a European billionaire who has started to rent it out. There are have been significant renovations done to the interior of the villa (since it was built in 1988), but it still remains the same in exterior appearance. I have seen her a couple of times, but never seen Chuck! Thank you again. You don't HAVE to stay in a villa that costs thousands, even tens of thousands per night (the mind boggles). Take a look at my sections on "cheap" restaurants, villas, hotels, etc. (you can use the Site Search). There are often really cheap flights into SXM - see my Cheap Flight Finder. You'll find that there's an Anguilla for just about every budget (I guess we could use a hostel, though ;-) ). My parents stayed in a villa next door to Chuck. They said it was the most beautiful place they ever visted. They both have passed now I'm so glad they had that experience. Maybe someday I will be able to make that happen in my lifetime. Thanks for the update on Sprocka. Those were the days of wine and roses....dancing, partying, working and plain ole enjoying life on the island. I won't be back as i don't travel anymore but at least your reference is good for Sprocka's tourist entertainment schedule. If you see him be sure to tell him I said hi (from Deborah - with the ship project in St Kitts). I will be coming out with a book about my offshore entrepreneurship 101 (in the islands) later this year. Anguilla was my favorite of all the islands that I lived. Just a few comments. You mentioned an entertainer back in the old days. You misspelled his name. It is Sprocka. He is still performing on the island. You can catch him Wednesday lunch at Scilly Key then that night at Reaggae Reef on Sandy Ground, Thursdays at Cuisin Art Resort , Sonday afternoon playing jazz at Johnnos on Sandy Ground. I have been here off and on since 1988. Much has changed but it is still the safest island in the Caribbean with the best beaches. and fun loving people you will ever know,she has lived in many more exotic places in the world, but the Beach life has always been the most suitable for everyone in our family. Make her write about her adventures in Mexico, now thats just the beginning and the tip of the iceberg. Make her tell us everything. Join in and write your own page! It's easy to do. How? Simply click here to return to Celeb Stories Or Sightings.